Aston Clinton stopped the rot of three straight league defeats with a hard-fought 2-2 draw at St Albans City Reserves in SML Division Two. 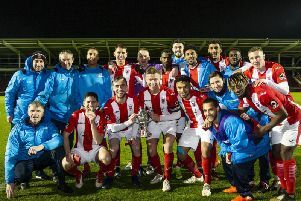 Despite having a number of regular first teamers missing, Aston began well and struck first when some good build-up play ended with Alex Smith rounding the keeper and slotting home. But St Albans hit back immediately as a defensive mix-up allowed the hosts to level proceedings at the break. St Albans had more of the ball in the second half and that culminated in them going ahead, however Aston responded strongly and earned themselves a point when Luke Russell skinned the left-back and put in a delightful cross for Lewis Workman to hammer in. Joint manager Jordan King said: “The lads worked very hard and we showed that we are all in it together. Everything we are working on in training is starting to show on match days now. The reserves drew 1-1 at home to Stony Stratford.